“Will we see any Avocets or Stilts?” This is a question we get on almost any field trip to a location where either or both species might be expected. Clearly, these two similar black and white birds, with their long, backward bending legs, long up-curved bills and distinctive plumage, are definitely favorites for most birders. While they are similar in many ways, they are also different. Black-necked Stilts have pink legs while American Avocets have blue legs; and although both are black and white, the distribution pattern for each is quite different. American Avocets have no black on the neck or face, while the black neck and face give the Stilt its name. Finally, the American Avocet, in breeding plumage, molts into an orange neck and face (photo 1) while the Black-necked Stilt retains its black and white plumage without changing for breeding purposes. Unfortunately for Florida birders, American Avocets only show up in the winter without the orange head and neck. Their summer breeding range is primarily in the western United States and Canada, but occasionally (rarely) late breeding plumage birds arrive in Florida for the winter before they have lost all their color. Photo No. 1 was taken at Merritt Island National Wildlife Refuge in January. 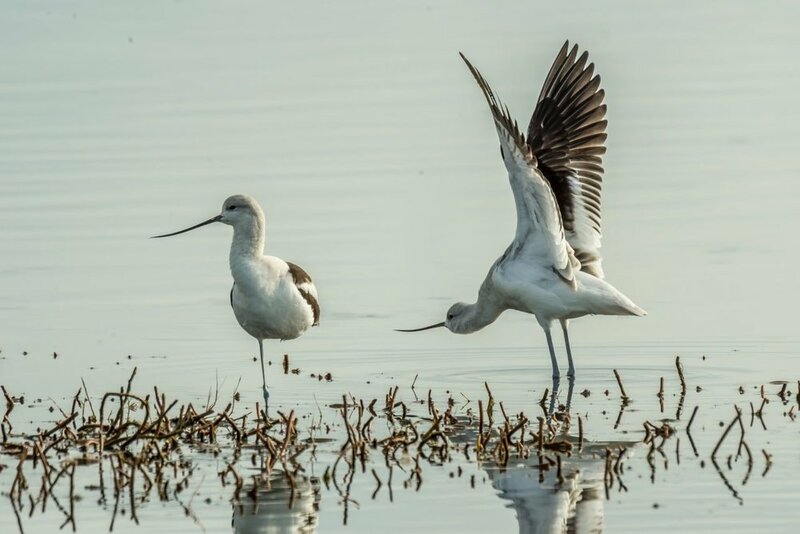 Finding American Avocets sometimes can be very difficult as they often tend to remain congregated some distance away, with their heads buried in the water searching for aquatic insects and small crustaceans, although they will sometimes eat seeds. Typically they will put their whole head underwater and swish back and forth on the bottom to stir up their food. With four Avocet species worldwide, the species is in the genus “Recurvirostra” which is derived from a combination of the Latin words “recurvus” meaning “curve backwards” and “rostrum” meaning “bill.” I assume the “curve backwards” part refers to the legs, for I’m not sure how you would describe the up-curved bill as “backward.” While the American Avocet is our only species of Avocet, the British version, the Pied Avocet, which has a partially black head and neck, is the symbol of the famed British Royal Society for the Protection of Birds, even though it was market hunted to extinction in Great Britain before World War II and interestingly returned on its own years later to breed on salt marshes that were created by the British to deter German invaders during that war. And so, Dear Reader, you may rest assured that if you join a field trip to any shorebird birding location where either American Avocets or Black-necked Stilts might possibly be found, I guarantee you that the leaders will make every effort to find them. Many a field trip that has been otherwise pretty much “blah” has been deemed successful if one, or both, of these species were found. For more information on Avocets, see: en.wikipedia.org/wiki/Avocet, and www.allaboutbirds.org/guide/American_Avocet/id.